Branham v. Rock, a personal injury appeal from the Supreme Court of Kentucky, involved plaintiff who was injured while riding as a passenger in her husband’s truck. She was not wearing a seat belt when the truck drove off the road and hit a tree. The passenger side airbag deployed but did not prevent her from hitting the front windshield. He was briefly unconscious following the car crash. Emergency workers arrived at the scene and took her to a local hospital where doctors ordered a head and neck CT scan. The scan was done “out of an abundance of caution” to rule out internal bleeding. 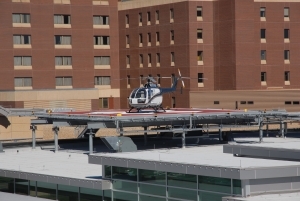 She was then transported by air to another trauma center. There doctors ordered a chest x-ray, which revealed blunting to the left costophrenic angle, which could be related to “effusion or scarring” and a “3.5 cm mass-like density” in the left lower lobe. This caused concern among doctors, but she was discharged with instructions to follow-up with her primary care physician. About 36 hours later, she died from what the autopsy revealed to be a ruptured aorta caused by blunt-force trauma to the chest. A year following her death, plaintiff filed a wrongful death action, claiming medical malpractice against the hospitals and treating physicians. The trial judge dismissed claims against hospitals on grounds of sovereign immunity, and the jury found for the defendants. Plaintiff appealed trial court’s finding of sovereign immunity and jury’s verdict claiming it was inconsistent with evidence presented at trial. Medical malpractice attorneys in Boston can explain sovereign immunity is a law that exempts governmental organizations (including some public hospitals) from liability in civil lawsuits or limits liability to certain level. On appeal, the court looked at several issues, including evidence submitted about one of the doctor’s medical licenses. This doctor had allegedly prescribed controlled substances (narcotics) to three people who were not his patients. The state medical board conducted an inquiry, which found doctor acted with a gross disregard for the standards of care necessary to protect the safety of the community of his patients. This inquiry was not limited to the controlled substances, as it also included his practice in the emergency room as a whole. He was ordered to undergo training within six months in controlled substances and follow a number of other conditions. Nine months later, he had not taken the training and was fined $40,000. At a deposition, he testified his problems with the controlled substances related to a situation with a business partner, and he had later completed the required training. The trial excluded any mention of this issue, as the court found it not relevant to the matter at hand. The court found, since plaintiffs had not sought to introduce any evidence doctor did not have an adequate knowledge of the standard of care owed to plaintiff in this particular case, trial court was correct in finding his past licensure history was irrelevant to the trial. The court also affirmed trial judge’s finding of sovereign immunity.